Written by Sudeep Uprety , Manager of Research Uptake and Communications at HERD. This article was originally posted on the HERD website. Click here to view the original version. 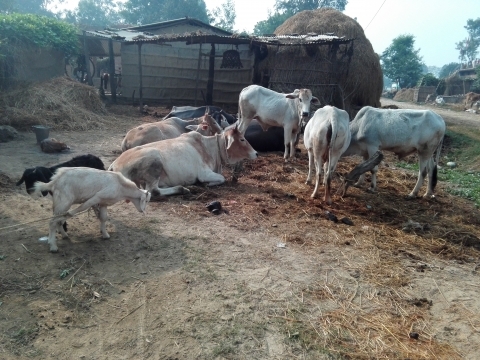 Sunita Nisadh, aged about 35 (she didn’t know her exact age) of ward number 12, Godiyanpur Basti of Gulariya, Bardiya had six children (3 boys and 3 girls). She and her husband work in the field as labourers (adhiyaan) to earn their living. Realising that she cannot afford to give birth to more children, she has undergone sterilisation. Sunita and her husband have a tough time to manage food for their kids. Due to poverty, all they can afford to eat is rice and potato (as potato is cheap). They do not have their own land to grow other vegetables. They have a house in a small land but do not have the legal papers (Laal purja) to claim the ownership. Sunita’s children go to school but her elder daughter dropped out from school in order to support Sunita economically. She is taking tailoring training so that to she could earn extra money by stitching clothes. Language is also a major communication barrier as the kids feel difficult understanding and learning Nepali language (their mother tongue is Awadhi). Some of the kids just leave school as they find difficult to understand Nepali. Nutrition is a major problem for many children in Godiyanpur. As most of the families are economically backward, both the mothers and the infants and young children are short of proper nutrition. 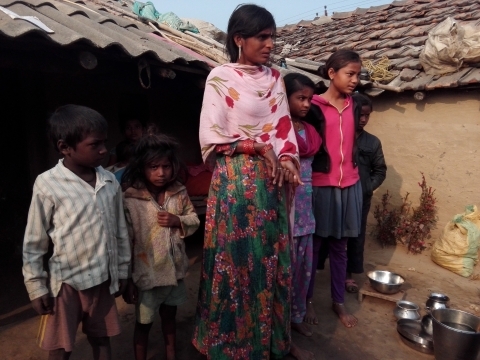 Sunita could not exclusively breastfeed her children continuously even for 2 months. Moreover, she was giving birth one after another and her health condition was ailing. In the community, generally there is practice of feeding the infant with goat’s or cow’s milk. Though this community is accessible to a health post nearby in terms of distance, there seemed to be a wider social gap in terms of knowledge, attitude and practice of utilising available health services. 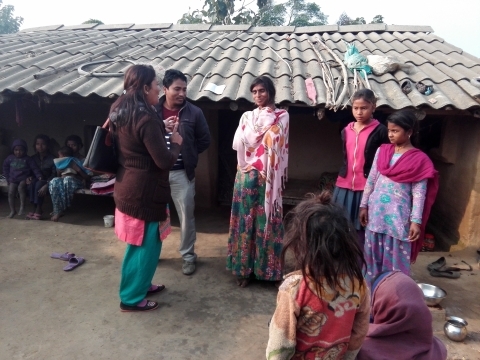 Though Female Community Health Volunteers (FCHVs) visited occasionally providing iron tablets for the pregnant Sunita and counselling about the benefits of institutional delivery, she delivered all her children from home. Pure drinking water is also a major factor for worsening health condition of Sunita and her family. The water has a high arsenic concentration and they are forced to drink and use that water as they have no other options. 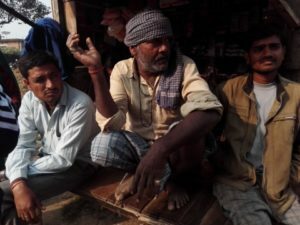 Mewalal Tamoli, aged 65 living in Chand Tole of Pragyagpur, ward number 14 of Gulariya, Bardiya was resting by a local paan shop when we went and spoke to him. Mewalal’s both sons were working abroad in Gulf country to support their Mewalal and his family of 8 members. Mewalal is looking after his wife, daughters-in-law and grand-children. Mewalal shared that there is no practice of exclusive breastfeeding for newborns. From generations, they have been feeding newborn babies with goat’s milk with the belief that goat’s milk is considered pure. Furthermore, the community dwellers also practice traditional healing methods whenever they get sick. Nowadays, to an extent with counselling by FCHVs, the people have started visiting health facilities – that too only in severe cases. Mewalal shared that most marriages for both boys and girls take place by the age of 18. During our field visits, we came across several of such families and the problems seemed to be common. Water, sanitation and hygiene (WASH) sector needs more attention as we observed people using water with arsenic, no proper drainage and toilet facilities, flies all over the house and children exposed to polluted atmosphere. Another major problem is the age-old cultural beliefs and traditional practices. People still preferred going to traditional healers for health treatment while they are ill despite the fact that there was a health facility nearby. Likewise, there is also practice of feeding the newborns with goat’s milk right from 2 days after birth instead of mother’s milk. None of the families that we visited practiced exclusive breastfeeding of infants and young children. There is some level of awareness due to occasional counselling by FCHVs but FCHVs are also overburdened by the range of activities and large coverage area where they are supposed to provide counselling services. Early marriage practice in the community also seemed to be a contributing factor in terms of degrading health conditions. 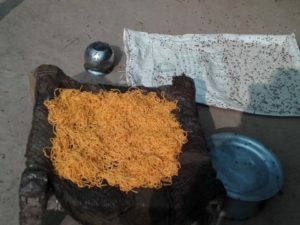 In terms of nutritional behaviours, though the community members were quite aware that the mothers, infants and young children require nutritious diet, the economic hardship seemed to be a major obstacle for them as they were forced to eat potato and non-iodised salt as they were cheaper. The people didn’t have their own land to grow vegetables and buying them from the market was expensive. As Multi-Sector Nutrition Plan (MSNP) envisages multi-sector approach to improve nutritional conditions, it is also imperative to understand and address the social determinants of nutrition – the social-cultural and economic factors that affect the nutritional outcomes. The Health, Research and Social Development Forum (HERD) is an NGO in Nepal that promotes evidence informed policies and practices for sustainable development in health, environment and social sectors. As part of the Poshanka Lagi Hatemalo (Partnership for Nutrition) project, awarded to UNICEF by the European Union, UNICEF has partnered with HERD to work directly with the Ministry of Federal Affairs and Local Development to ensure the effective implementation of Nepal’s Multi-Sectoral Nutrition Plan.